Sounds like a great plan! Good for you! Have you heard about project-based homeschooling? It's a way of teaching self-directed learning. There's a book and blog, Camp Creek. The author is Lori Pickert. I work second shift and my husband works first shift (usually very early). We often overlap, so I arranged for an in-home sitter (cheaper than daycare) who comes during that time so that I don't have to worry if he stays late. I homeschool in the morning and my sitter helps the kids finish up if there's anything to do and helps with reading and stuff as well. She doesn't teach, she's more like a re-enforcer of ideas. "Re-enforcer of ideas"-what a great concept! I now work 2nd shift and husband 1st im glad to know there are pthers. I work night weekends. I teach during the week. My husband works mon-fri day shift. I do not like being away from my family but we make it work. We have our family fun time also whenever God allows us too. When I fall short on a subject. My husband the principal steps in. We use a daycare provider that takes 'drop in' homeschoolers as well as my husband and I flip our schedules. I've read where other homeschool parents have created "drop-in coops" for their kids. It's a great way to manage work and school responsibilities. Hey, thanks! I'm in San Antonio. Central Texas FTW! My daughter is a competitive gymnast so she trains 8-12 everyday and then comes to my place of employment. I have lunch from 12-1:30 so we do the work she needs help with then and once I am working again, she does the work she can do on her own. My employer is very flexible. I am a nurse and work three days a week (full-time), one weekend and two week days. 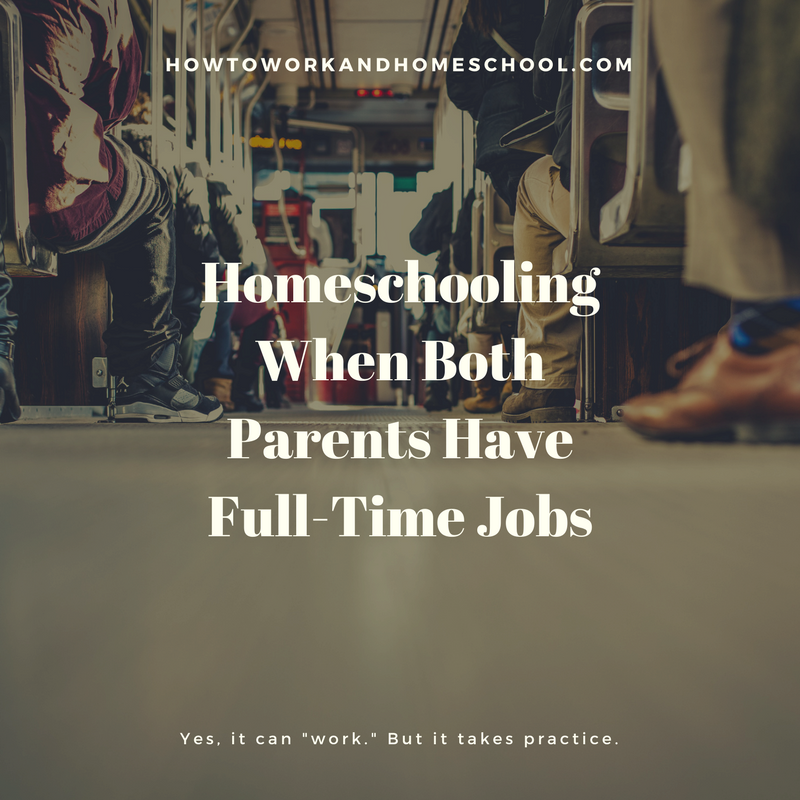 My husband works mon-fri. We have a babysitter for the two days we both work and homeschool on the off days. I knew another couple that both were nurses and each worked 3 days a week, but made it so one parent was always off. You only get to see your spouse one day a week, but it works. My DS is 6 we dabbled in homeschooling last year and are seriously doing this year - public school starts tomorrow and he will be the only "older" kid at daycare until school lets out each day - DH and I work full time. We will be Afterschooling him with him taking handwriting and math worksheets to daycare - hoping he does not get too bored during the day!